Why have a Hopi Ear Candle treatment at Therapy House? Do you suffer from conditions related to your ear, nose or throat? Hopi ear candles are an ancient and natural therapy that can offer relief from issues such as sinus problems, compacted ear wax, tinnitus and headaches. Hopi ear candle treatments can also help to reduce inflammation in the ears and sinuses, relieve the symptoms of hay fever, rebalance your body’s natural flow, and generally calm and relax you when life is stressful. Hopi ear candles are used to treat a number of conditions of the ear, nose and throat. Quite different from conventional wax candles, a Hopi ear candle is actually a cotton tube, infused with beeswax, honey and therapeutic oils. What can Hopi ear candles be used to treat? 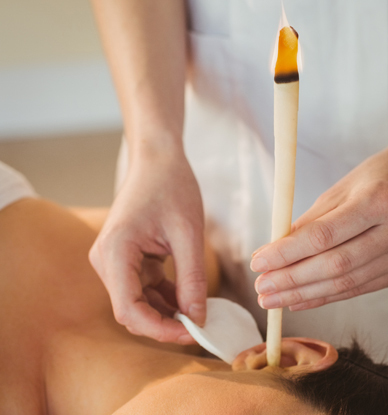 Ear candling can also promote healing, boost your immune system, detox your lymphatic system, and even improve your vision, hearing and taste. The candles work by vaporising their ingredients and causing mild suction in the ear, which lets the vapours gently massage the eardrum and ear canal. Once the candle is placed in the ear, it forms a seal that enables wax and other impurities to be drawn out. Don’t worry, no wax or ash will drop into your ear. Some people feel Hopi ear candles provide more relief for blocked ears than ear syringing because the treatment draws the wax from the ear rather than compacting it in any way. What happens during a Hopi ear candle treatment? The procedure is pleasant and non-invasive. At the beginning of the treatment, the practitioner will examine your ears and discuss your medical history and the problems you are currently experiencing. You will then lay in a comfortable position on a massage couch before a Hopi ear candle is put into the first ear, lit and held in place for approximately ten minutes, after which the ear is cleaned. We will then repeat the procedure in your other ear. Finally, you’ll receive a facial massage to improve your circulation and we’ll ask you to drink a glass of water to rehydrate your body. Hopi ear candle treatment takes approximately 10-20 minutes per ear. As we perform a light facial massage at the end of your treatment, you should expect to be in your appointment for 45-60 minutes. The number of Hopi ear candle treatments you need will depend on your reason for choosing this therapy. If you want relief from a short-term problems such as a cold, then you may need several treatments over a week to 10 days. For longer term problems, such as tinnitus, you may benefit from a number of treatments over two to three weeks with a follow-up treatment once a month from then on. Many people find that positive side effects are better clarity of sound and an immediate relief of pressure in the ears or sinuses. After any treatment at Therapy House, we’ll give you detailed aftercare instructions that relate to your procedure, so you know what to do and what to expect. It’s very normal for ear wax to naturally work its way out of your ear over the first 24 to 48 hours post-treatment, so you may want to cover your pillows with a towel to prevent any staining. We usually recommend that you avoid submerging your head underwater for 24 hours post-treatment, and that you drink plenty of fluids to help flush toxins out of your system. If you experience a runny nose, please blow it instead of sniffing. Under no circumstances should you insert anything, including cotton buds, into your ear. Can anyone have Hopi ear candles treatment? Although many people can and do benefit from this treatment, we won’t carry it out if you have an ear infection, perforated eardrum, inflammation within the ear, or if you have grommets fitted. We will also talk you through the candles’ ingredients to check that you’re not allergic to any of them. Want to know more about Hopi Ear Candles?